As with the earlier ‘Medici’ porcelain works in Florence, the Doccia factory was founded by a nobleman who was himself closely involved in the technical side of making porcelain – the Marchese Carlo Ginori (1702-1757). Indeed, it is likely that the Marchese was aware of and admired ‘Medici porcelain’, as he occasionally used the same factory mark of the dome of Florence Cathedral, and as the stencilled decoration on pieces like this dish recalls the painted patterns on certain Medici wares. 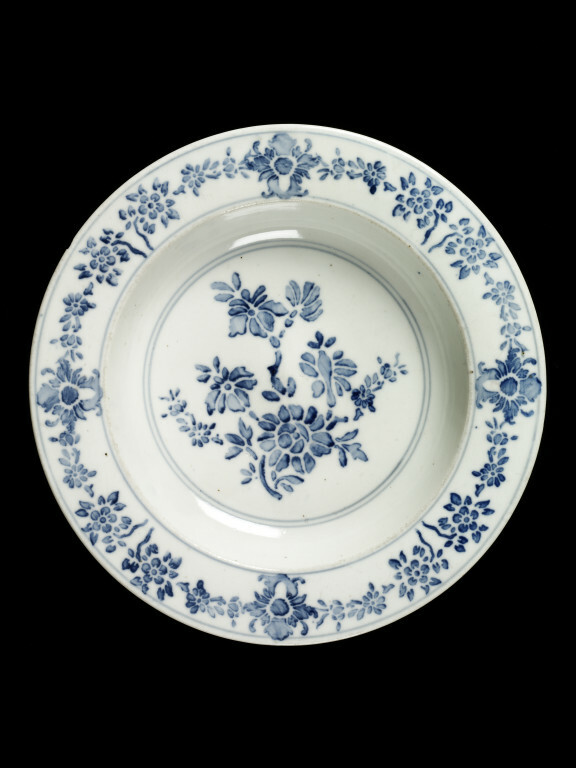 Under Carlo Ginori, the factory undertook some remarkable experiments in porcelain production, including ambitious large figure sculptures, some of the earliest attempts at transfer-printing in underglaze cobalt blue, double-walled pierced cups inspired by Chinese Dehua imports, and useful wares like this dish decorated in cobalt blue using stencils. The method of using stencils for the main painted decoration appears to have been unique to the factory in eighteenth-century Europe, though stencils were used elsewhere to ‘reserve’ panels in white against a ground colour. 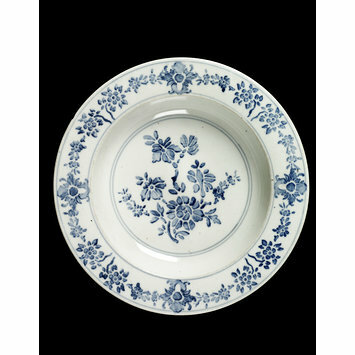 It is interesting to note that, although the factory was founded by a nobleman, several of these production lines involved the use of underglaze cobalt blue. This suggests that at Doccia blue-and-white decoration was not regarded as an inferior type of decoration to polychrome enamelling, as it was in England and elsewhere in Europe a little after this piece was made. The greyish body and grey cast to the underglaze cobalt blue are characteristic of Doccia porcelain. Plate of hard-paste porcelain with blue-stencilled decoration. Flat rim, deep well and recessed foot. In the middle is a spray of flowers in a double circle. On the rim, flowers are separated by four cartouches. Traces of sand adhering to the foot-rim and under the base. The centre is pushed upwards. The shape, taken from Chinese Porcelain, is typical of the earliest Doccia porcelain. Plate of hard-paste porcelain, Doccia porcelain factory, Doccia, ca. 1750. 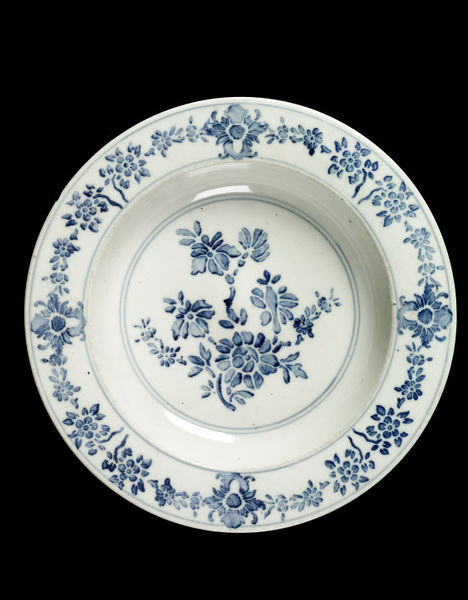 A soup dish with decorations in monochrome underglaze blue that have been applied with a stencil, a technique usually called “a stampa” or “a stampino” at Doccia although this definition never appears in contemporary factory documents; the term that is used to describe it in 1744 is probably “blau a fiori” (with blue flowers, AGL, I, 2, f. 39, Fabbrica delle Porcellane di Doccia. Scritture e documenti, fasc. 4). The decoration “a stampino” is quite simple and usually consists of floral motifs or, in a few rare cases, heraldry. It was executed using a stencil made of paper or a thin sheet of copper for flat surfaces or lamb skin for curved surfaces. The stencil was attached to the porcelain biscuit and cobalt blue paint was spread over it with a brush so that the colour passed through the holes in the stencil to create the decoration. It is probable that the extreme simplicity of the technique made it the easiest one to teach to the first painters at Doccia, most of whom were peasants with little or no artistic ability (CASPRINI 2000, p. 177-178; A. Biancalana, in LA MANIFATTURA TOSCANA DEI GINORI 1998, p. 28-29, plate 16-30). This type of decoration continued to be used for many years after the death of Carlo Ginori and is mentioned around 1760 in the price list drawn up by Jacopo Rendellias “con fiori blù ordinario” (AGL, XV, 2, f. 138, Manifattura di Doccia. Documenti vari, c. 502r). The preference for porcelain with blue and white decorations which originated in China had a long tradition in Florence starting with the so-called Medici porcelains created by Francesco I de’ Medici in the 16th century (ALINARI 2009).Considering the decorative technique and the type of clay and glaze, this soup dish can be dated to the mid- 18th century. The dish, like the maiolica jar cat. 119, was donated by Alfred Brown, who at the time was the artistic director of the Società Ceramica Richard-Ginori.